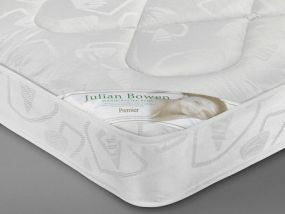 Julian Bowen’s small double mattresses are available in unique variations: The Premier Small Double Mattress and The Deluxe Semi Orthopaedic Small Double Mattress. The Premier Small Double Mattresses are available with a stitched quilted cover with an oyster damask ticking over a strong coil sprung system, which is guaranteed to provide long-lasting comfort. These are small but durable mattresses, so are ideal for a children’s bed or for the guest bedroom. 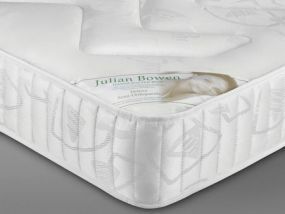 The Deluxe Semi Orthopaedic Small Double Mattresses are also available with a stitch quilted upholstered ticking with a bonelle spring unit and a semi orthopaedic comfort level, which is ideal if you want a firmer mattress with a stronger coil sprung system, and are looking for long-lasting support and comfort. All of the comfortable and strong small double mattresses in the Julian Bowen range are available with guaranteed free delivery from Bedz 'R' Us.